On May 12, 2014 Norm Lewis made theater history by becoming became the first African-American performer to play the title role on Broadway. Sierra Boggess returned to the role that has won her acclaim in the London and Broadway 25th Anniversaries. A trip back to revisit this now 26 year old production is like a trip to musical theater antiquity, not quite the rightly revered “Golden Age” (1940s to 1960s), but the ‘80’s, to see a master at the top of his craft. Andrew Lloyd Webber has his own golden age introducing the mega-musicals: Evita, Cats, Starlight Express, Sunset Boulevard. However in contrast to our current standards; the pared down, acid laced, at times almost atonal, lyric infused complex emotions of this era’s icon, Stephen Sondheim, Lloyd Webber seems overstuffed at least, and at times ponderous, his huge lush, orchestrations suffocating to those who breathe the air higher on the cultural mountain, but of supreme comfort to those who can sit still, inhale deeply, and succumb to the unabashedly unfettered melodrama and romanticism of the near past. The story, for those just visiting our planet, is based on the classic novel Le Fantôme de L’Opéra by Gaston Leroux and tells the story of a masked figure (Mr. Lewis) who lurks beneath the catacombs of the Paris Opera House, exercising a reign of terror over all who inhabit it. He falls madly in love with an innocent young soprano, Christine (Ms. Boggess), and devotes himself to creating a new star by nurturing her extraordinary talents and by employing all of the devious methods at his command which include the now infamous crashing of the chandelier into the audience and a variety of backstage murders. Far from the Brit pretty boy image of Michael Crawford and those handsome leading men that followed here in the role – Lewis brings a sexually intense, almost menacing persona – not lithe but stocky, his suit a bit crumply as it would be, buried in his quarters in the Opera House sans sartorial benefit. He reeks of ego and animalism rather than the cerebral intellect of a maniacal composer. The result is that the seduction/hypnosis scene, in his gorgeous duet “The Music of the Night” with Sierra Boggess (reunited since The Little Mermaid) seems more insistent, overpowering in this version and every indication the magic of this opus still works. For a first time viewer of Phantom, one gets hooked from the moment the chandelier is revealed and the shot of light that is set off remains in your mind’s eye throughout the first scenes. From the opening where first Christine’s true talent is revealed, Sierra Boggess shines throughout the show. Reminiscent of Belle in Beauty and the Beast, and with the same light in her eyes and wonder in her heart, it is no wonder she was “hand-picked” for the 25th anniversary edition by Andrew Lloyd Webber himself. Her range and powerful voice remain strong throughout the musical, as does her passion for the role and for her Angel of Music, both a love and a fear. 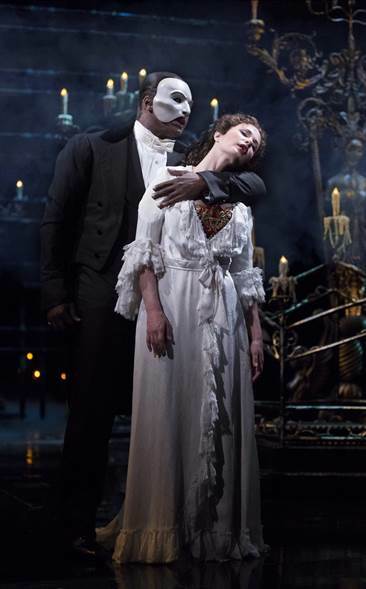 Opera Ghost Norm Lewis, while remaining both behind the scenes and very much present throughout “his” productions, lends a powerful force to the entire production. His voice, besides a few shaky notes, was solid, and his emotions came through, especially in the scenes with his muse. The infatuation he had with Christine was very real, and her willingness to help him but horror once she saw the true him, was evident from the instant his mask was removed. The two characters played off each other beautifully, especially in the final scenes. Evil Madame Giry, Ellen Harvey, maintained her character, always believing in and knowing the truth about the Opera Ghost. One wonders what her relationship was with him in a past life, but her strength and vulnerability shone through. She played the part well, as did Raoul, played by Jeremy Hays, whose princely looks lent itself to the role, and devotion to Christine was evident throughout. Comedic operatic characters Michelle McConnell and Christian Sebek, playing Carlotta and Ubaldo, sounded wonderful, and the acting of Laird Mackintosh as Monsieur Andre and Tim Jerome as Monsieur Firmin, was greedily funny. Polly Baird, playing Meg Giry, did not impress, besides acting in defense of her friend Christine. Her voice did not conquer her scenes. The scenes where the OG was communicating through notes to the staff of the opera were difficult to follow, with at times five characters singing over each other, became confusing to this viewer. Music by Andrew Lloyd Webber, directed by Harold Prince. Lyrics by Charles Hart (with additional lyrics by Richard Stilgoe), book is by Richard Stilgoe and Andrew Lloyd Webber. Production design by the late Maria Björnson, lighting by Andrew Bridge and sound design by Mick Potter with original sound by Martin Levan. Musical staging and choreography is by Gillian Lynne. Orchestrations are by David Cullen and Andrew Lloyd Webber.